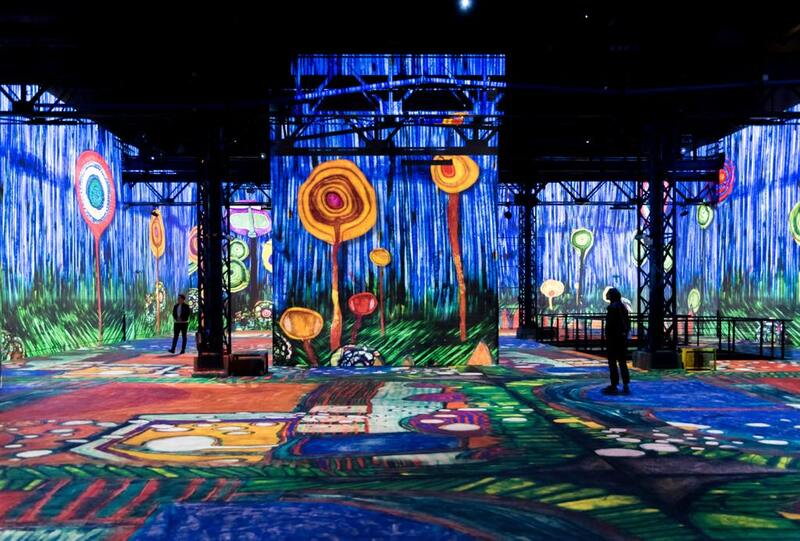 Fearing monumental gimmickry, I was wary about visiting Paris’s much-lauded new blockbuster attraction, the Atelier des Lumières, billed as a “digital museum.” Why is a screen needed to look at great art; why not just look at the art itself? I have to admit, however, that I was greatly impressed by the quality and beauty of the three presentations. 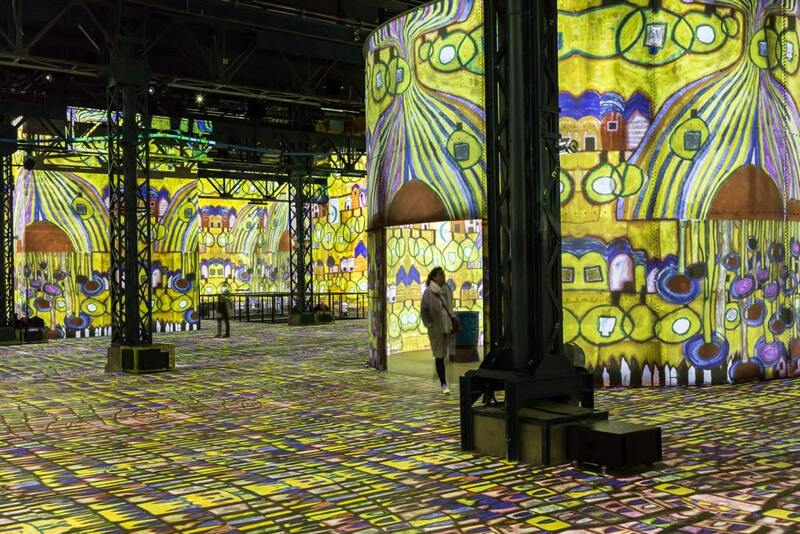 The shows effectively cover every inch of the walls and floors of the former foundry the Atelier des Lumières is located in, accompanied by appropriate music or sound effects. Visitors can wander around the main floor to watch the show or get a bird’s-eye view from the balcony. A smaller, close-up view of the monumental images being projected can be seen inside a circular structure in the center of the room. The main attraction is the “immersive exhibition” on the world of Gustav Klimt (1862-1918) and other Viennese artists of his time, including Egon Schiele (1890-1918). Leader of the Viennese Secession, Klimt was a great choice for the Atelier’s first show, with the decorative nature of much of his work and his jewel-like colors. But before showing his work, the exhibition sets the stage with images of turn-of-the-20th-century Vienna and at one magical moment turns the Atelier’s space into the interior of a palace, first in black-and-white then in color. A shorter program focuses on Friedensreich Hundertwasser (1928-2000), another Austrian artist (and architect), whose work was influenced by that of Klimt and echoed his predecessor’s brilliant colors and decorative patterns. Hundertwasser’s work seems especially well-suited to the digital manipulation it undergoes here. These two shows continue until January 6, 2019, but a third program changes more often. I saw a snazzy abstract black-and-white piece called “Poetic_AI” (by digital animation agency Ouchhh, with sound by Audiofil), which used artificial intelligence to create images, but from September 7 to January 6, a new program called “Colours X Colours” (by French artists Thomas Blanchard and Oilhack) offers macro images of paint interacting with canvas as artworks are made. This video is being shown in a smaller space called Le Studio, which also serves as a café. 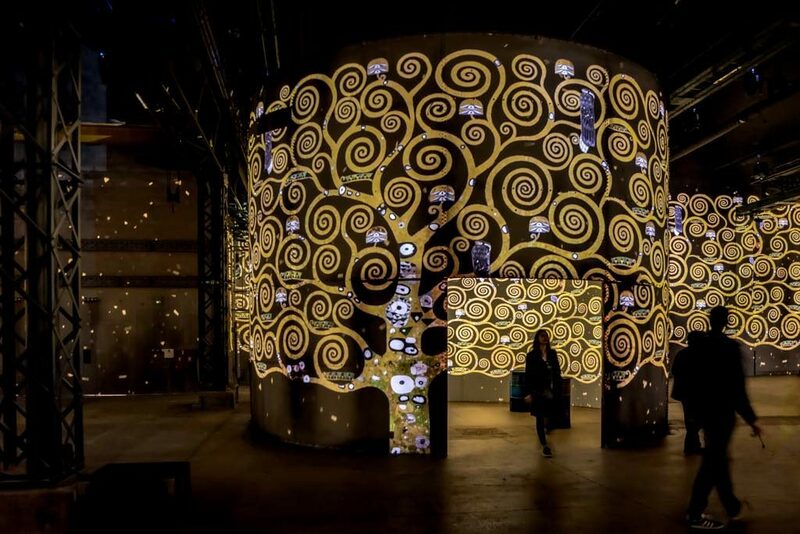 The spectacular Klimt and Hundertwasser programs were made by Gianfranco Iannuzzi, Renato Gatto and Massimiliano Siccardi, with musical collaboration by Luca Longobardi. Though they aren’t on hand to hear it, their work is applauded by visitors at the end of each program. One wonders what the artists themselves would have thought of this treatment of their work. My guess is that they, too, would have appreciated it. Next stop: Vienna, to see the originals. Merci pour cet article. J’ai trouvé l’exposition tout à fait inintéressante, très bruyante et à aucun moment chargée d’émotion. Je ne suis pas certaine que Klimt ait apprécié cette exposition. Hundertwasser était plus partant pour tout ce qui est nouveau. Mais aller à Vienne, oui, tout de suite pour retrouver ces magnifiques tableaux de Klimt chargés d’émotion. I always enjoy Heidi Ellison’s take on everything she experiences in Paris. 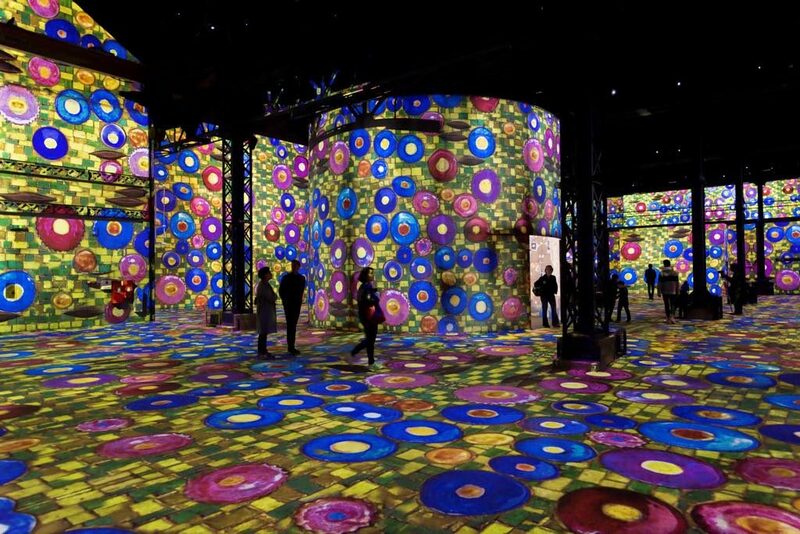 So I am doubly disappointed that I was unable to enter the Atelier des Lumieres on my very last day in Paris August 28. A half-hour sighting (all that was left of the day) was deemed “inutile” by five uniformed French guards and gruff ticket takers. Were they afraid I would get lost in the labyrinth or did they want to get away promptly for their aperitifs? I liked the Les Baux exhibition, but now I will go, as Heidi suggests, to Vienna and see the real things. An extraordinary show/experience. Not to be missed! I saw the Carrieres des lumeres in Provence back in 2006, when they were featuring art by Cezanne. I thought it was gimmicky and was not impressed, although others certainly were! I too would rather just see the art itself, but Klimt does look like a great choice for this exhibition. Read about the exhibit before a visit to Paris from the US in May and bought a ticket in advance. The art came to life and along with the music moved me to tears, it was extraordinary! Have recommended it to others who also enjoyed it and like me cannot wait to return. Open Monday-Thursday, 10am-6pm, Friday and Saturday until 10pm and Sundays until 7pm. Online booking required on weekends.